Silikal has totally revolutionized what used to be malodourous fitness center flooring. Fitness center floors no longer capture and hold microbes and bacteria, thanks to modern ingenuity. Flooring for a fitness center has undergone a tremendous amount of beneficial changes including being made totally non-slip. 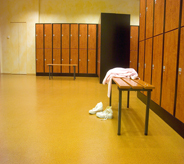 Most people have been inside a fitness center, but few have paid much attention to the fitness center flooring. Maybe it was because of all those fit bodies running around there, or maybe it’s just that the flooring was blah and did not warrant much attention? If the reason is the latter, that’s understandable as so much of the fitness center flooring out there is totally nondescript and does not even warrant a glance. However fitness center flooring will get more than a glance if it uses the wrong kind of flooring. For instance there is always rubber flooring, usually seen in the roll up variety. There are very few fitness center operators and owners though who know and do what’s right with this kind of flooring. It should be taken up completely at least once a week, and the area under it needs to be deodorized as well as cleansed with a strong detergent and then allowed to dry properly before being reinstalled. That is a lot of work, but it is something that is obligatory to perform if anything can get under that fitness center flooring. You see, water such as human sweat, and other things can go under the flooring. There they fester, and become a home for bacteria, assorted microbes, and also eventually staph and mold will settle in there. 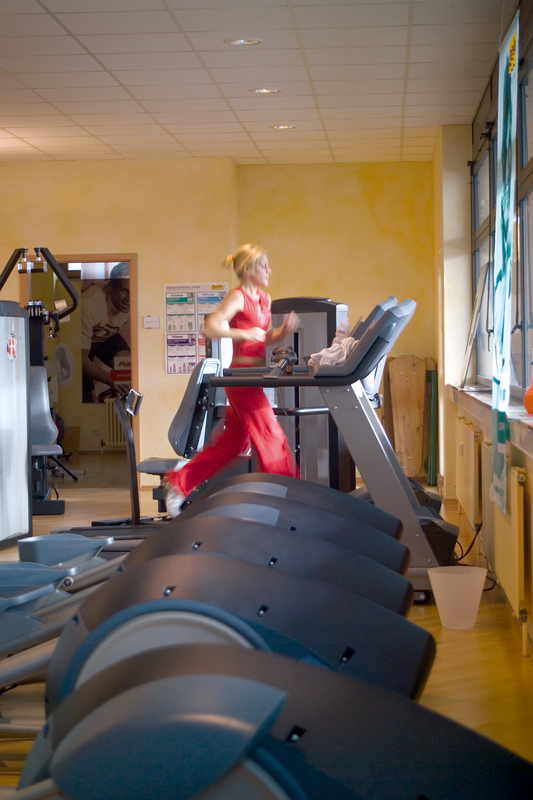 Often a fitness center will have a very singular stench. Look to see what kind of flooring they have, and chances are great that it will be some kind that allows penetration of the above, and the stench is coming from the floors. Run do not walk out of there, for your own good. 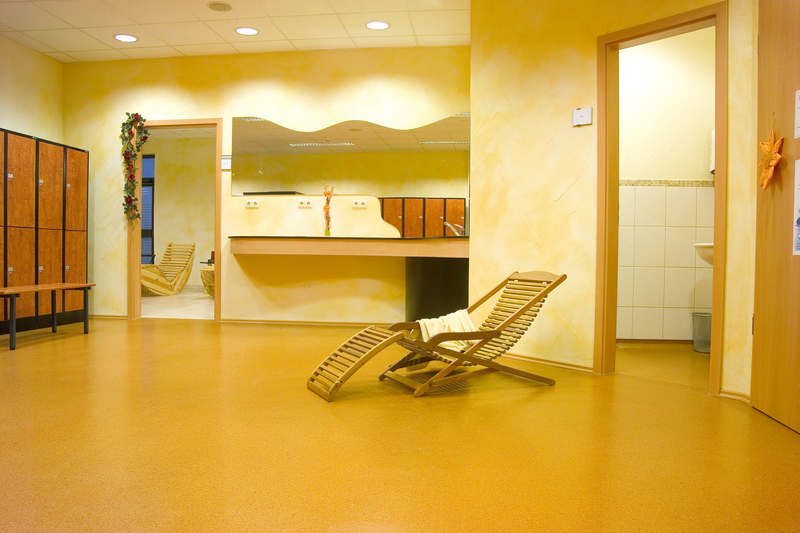 In addition good fitness center flooring will prevent slippage by anyone doing any of the fitness exercises. Whether in time to music, or lifting weights, it’s important that everyone have very safe footing. Slip resistance is also terribly important right in front of your front door and all the way to the reception desk. People are known to come running in to get away from rain or from snow, and then experience a slip and fall. Thus it is highly suggested that whatever flooring you utilize that you make sure that it is absolutely non slip. Inside your fitness center, you will undoubtedly desire a wooden exercise floor just as all the upscale fitness centers have, and that’s fine but do not make the mistake of not sealing it well against any intrusion such as sweat, spilled drinks, etc. 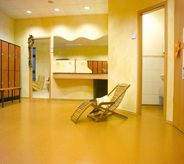 Chances are that you will find once you do some serious looking for your fitness center flooring, that you will realize that Silikal flooring is exactly what you desire, whether it’s for the front desk area, or the exercise areas. Silikal flooring is absolutely beautiful and will reflect the care that you have for your center and your customers as well. And if you so desire, Silikal can embed your very own logo or company name right on the flooring as one enters your premises. Now, you can compete with the big boys!